I am a mom and a physicist, and at one time I attempted to give birth at a birth center. But I wouldn’t make that choice again, because I’ve since learned about the risks to my baby. Babies born at home face a 4-fold higher rate of neonatal death (Grunebaum, et al), an 18-fold higher rate of HIE or brain damage (Wasden, et al), and a 10-fold higher rate of a 5 minute APGAR score of zero (Grunebaum, et al). Midwives must convince women to suspend common sense and put their babies’ lives and brain function at risk unnecessarily, by getting them to choose homebirth. There is nothing more important to me than the life and healthy brain function of my baby. As a scientist, I like to see that results can be independently verified, so I calculated the out-of-hospital mortality rate myself. I was also curious to see how hospital and out-of-hospital mortality rates have changed over time. Mortality rates shown in the plot below come from the CDC Wonder Website, where Vital Statistics data is available to the public. Birth center and homebirth mortality rates are combined because these birth settings cannot be separated on the Wonder Website. Midwife-attended out-of-hospital birth is 3 times more deadly than comparable-risk hospital birth with midwives, consistent with published research. Out-of-hospital birth is more deadly than all types of hospital birth, and has been for many years. 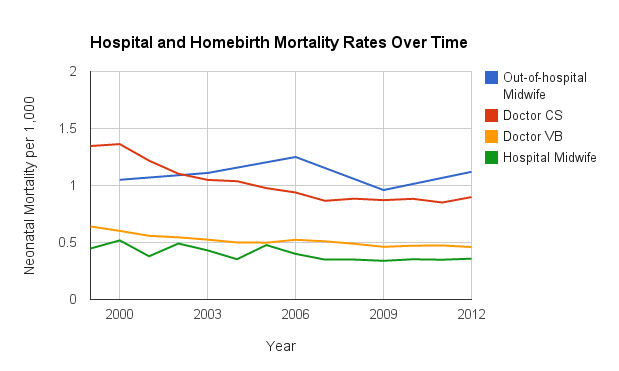 Hospital birth is getting safer over time, while out-of-hospital birth is not. It’s no wonder that doctors and midwives are increasingly unwilling to attend homebirths, and it’s no wonder that insurance companies are increasingly unwilling to cover homebirths. As homebirth safety lags further and further behind hospital safety, homebirth is a practice that logically ought to become marginalized by society over time. As often happens with matters of settled science, there is a group selling an alternate version of reality. In this case, sadly, it’s midwives. The Midwives Alliance of North America (or MANA), the professional organization of homebirth midwives, has lied, saying that homebirth is safe, even though the mortality rates they published show the opposite. MANA did not even include hospital mortality rates for comparison (gee, I wonder why), but they stamped “safe” on the results anyway. MANA is clearly lying to con women and continue making a living attending homebirths. Homebirth should be a dying industry, and to keep it going, midwives must convince women to suspend common sense and put their babies’ lives and brain function at risk unnecessarily, by getting them to choose homebirth. Claiming homebirth is safe defies the very spirit of informed consent. Truthfully, homebirth hasn’t been safe for a long time. It's a betrayal that midwives, of all people, are lying to women about homebirth. My goal, by blogging here at babyMed, is to share accurate information about homebirth. EDIT: See a continued discussion of these statistics at my next post, "Safer Home Birth Requires Educated, Regulated Midwives." Previous: Who Will Be Involved In My Care on Labor & Delivery?